To what extent can and should existing laws be enforced in the digital sphere? The one – and only – good thing about hate speech and #FakeNews? They have finally pushed the topic of online responsibility into public discourse. While the Facebook data scandal has delivered unsurprising results, one thing has turned out to be overwhelmingly evident two decades since the start of the Internet Age: demanding “responsibility” and "liability" in the digital space does make sense. People seem much more willing than before to acknowledge that those who travel the worldwide web are responsible for what they do there, be it the individual citizen or an online platform. They are finally realizing that “responsibility” is the prerequisite for what makes us a society: freedom within the limits of freedom. The question of who should be held responsible for what, where and when in the online sphere is hardly new. A number of business sectors – including the creative industries – have grappled with this question since the turn of the century. It is an issue that affects all participants in the digital world and touches on a wide spectrum of rights, including the right to privacy, property and personal integrity. Even though we’ve been facing these challenges for more than two decades, it’s only now dawning on people that the issue of liability has implications beyond such things as the sale of fake goods, advertising on illegal sites and even the illegal distribution of films and music. These are just a few examples of cases keeping courts and prosecutors busy to date. Only now have we finally reached the point where society as a whole is ready to discuss the extent to which existing criminal and civil law can and should be enforced in the digital sphere. Keep in mind this must be achieved in an environment still based to a great degree on anonymity – enforcing the law here is not exactly easy. This was the inspiration behind the well-intentioned German Network Enforcement Law, put in place in January 2018. In Germany, we have seen a number of federal court decisions concerning the scope of responsibility in matters relating to the illegal distribution of content as well as to the distribution of illegal content. The scope of potential liability reaches all the way from the registrar – that is, from the body responsible for website domain registration – to the website host and the provider of internet access. When we look at these cases – which involve free wifi access and the scope of liability of access providers – it becomes evident that the rules need clarification. Indeed, even the act of providing a link to illegal content brings up complicated questions of accountability. For example, in recent important decisions, the European Court of Justice – finally – determined that the notorious Pirate Bay site was directly infringing copyright by facilitating users’ access to copyright works and recordings, and ruled that linking by commercial services to works made available without right holders’ consent is presumed to infringe copyright. It has taken many years to achieve these judgments in the courts. As so often in these matters, the intermediaries distributing the content at the outset have not been willing to take clear responsibility. Instead, they point the finger at those individuals or entities sharing or uploading the content online. The idea behind this approach is that the person and/or entity should bear liability – and preferably also be prosecuted. This approach implies the storage of user data and, if necessary, passing it on in the case of an investigation. The more you release intermediaries from liability – even though they might be acting intentionally, accepting the consequences of their actions – the tighter the noose is tied around the necks of identifiable individuals in the process of civil law disclosure procedures and police investigations. At the very least, the dilemma we face will become clear when in the same sentence reference is made to data retention on the one hand; and the often proclaimed “right to anonymity” on the other. Our current discussion shows that ambiguity in matters relating to liability is socially and economically unacceptable both with regard to individuals and online platforms. However, the debate surrounding Germany’s Network Enforcement Law also illustrates the complexities involved in finding a solution. In the realm of freedom of expression, it is particularly important that we exercise caution. An opinion is not a fake pair of trainers, that is, it is not something easily identifiable according to certain brand characteristics. An opinion is also not a data file; it is not something that can be identified using a form of fingerprinting. In fact, there is much more at stake here, namely the preservation of our peaceful coexistence with one another. If our goal is to de-escalate the current atmosphere, the first step would be for all participants in the digital sphere to fundamentally acknowledge responsibility for their online activities and behaviour. We must precisely define and delineate the legal rights and obligations of all participants so everyone has a clear idea what they’re getting into and which role they play online. This would, of course, extend to issues of licensing which is the financial lifeline of the media and creative industries. The world’s largest music platform still calls itself “technically neutral” - really?! For example, it seems that YouTube – a service used for free by more than one billion users, and a body that analyses, curates and essentially participates in making content uploaded to its site available – continues to call itself a “technically neutral” platform. This status is based on a very old set of rules that allows such services to circumvent what would otherwise be an obligation to acquire regular licences. This creates market distortion – one characterized by a “value gap” to which the music industry has been pointing for years. On the one side, we have user upload services like YouTube, which make content owned by other people available free of charge – and let’s not forget that we are talking about content in whose production these services didn’t invest. On the other side, we have music services such as Spotify, Apple Music, Amazon and Deezer, bodies who must pay the rights holders of regular commercial licences for the use of their music content. Once again, let’s not forget that this is content the entire industry depends upon to refinance its investments in the market – without it the industry would be robbed, sooner or later, of the very basis of its livelihood. 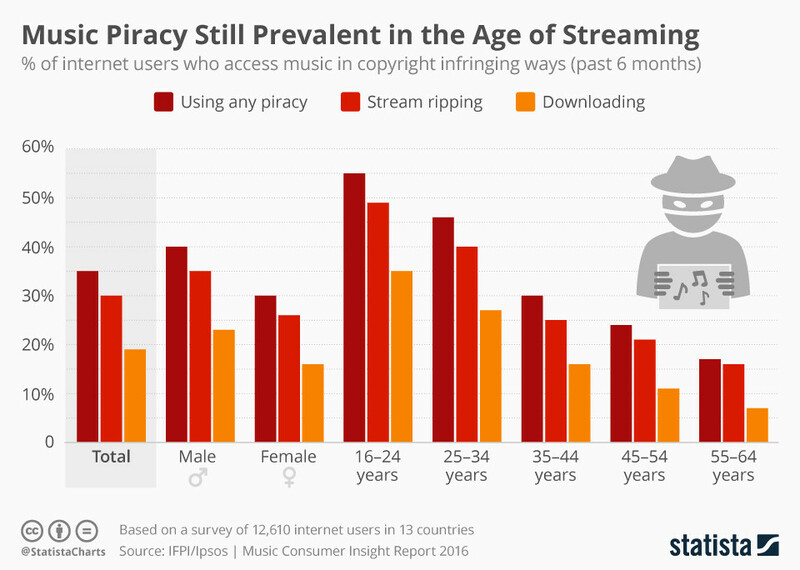 This makes it all the more important that we support the approach pursued by the European Commission in the framework of European copyright reform, which seeks to make it clear that certain platforms should be obliged to enter into licensing agreements with creatives and their partners. How should we regulate the flow of online content? What causes good people to turn bad online? If we want to ensure sustainable and balanced growth of the digital content markets, it is essential that we achieve clarity in these matters. This must take place not only at the national level but also at EU internal market level, for example, in the interests of the EU’s Digital Single Market. Any other path will only lead to the erosion of existing laws and, incidentally, to an undesirable pre-eminence of terms and conditions which will not benefit consumers or society at large. It is important to prevent a weakening of the rule of law which should include the ability to prosecute infringements both off and online. However, this is by no means a suggestion that we should overregulate the digital sphere. Instead, our highest social priority should be to clarify how various participants can be expected to interact with one another online. This should be the concern of all participants in the digital sphere, including platforms, rights holders, consumers, businesses, start-ups and, last but not least, citizens.